- great for acne. Tip: I dabbed this mask on my acne overnight as a spot treatment and those acne reduces in size the next morning. No, it will not make acne disappear overnight of course but it does shrink and facilitate quick healing. - it is a bit drying. Well, it is supposed to dry out pimples. If you have dry skin, then obviously this is not recommended. If you have dry skin but with some acne, then perhaps you can just dab on the acne alone and not on your entire face. Water (Aqua), Kaolin, Bentonite, Glycerin, Zinc Oxide, Propylene Glycol, Sulfur, Chromium Oxide Greens (CI #77288), Fragrance (Parfum), Phenoxyethanol, Methylparaben. Would I buy again: Always! 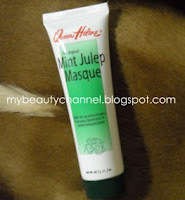 My skin will be not happy without this mask.